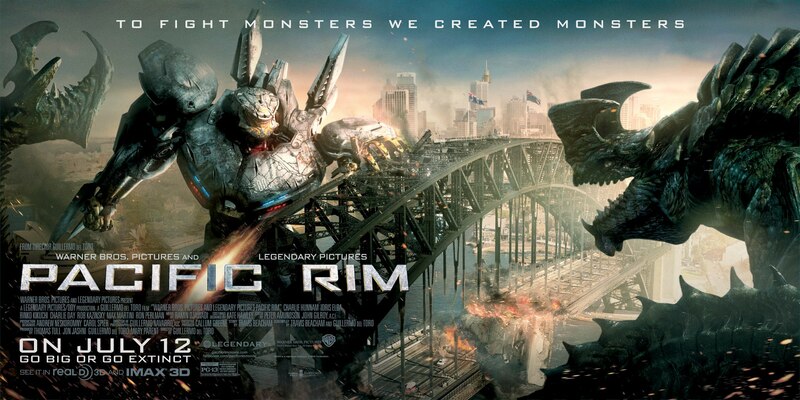 Giant robots vs. giant monsters. Even with a semblance of a story! Who knew? Guillermo del Toro’s big budget love letter to Japanese monster movies and seemingly every anime about giant robots (Gundam, Evangelion, etc.) was one of my most anticipated movies of the year. I have to say, when I found out it came in number 3 at the US box office, I was not really surprised. Why? Because over the years I’ve always found movie goers to be more interested in the “sure thing.” Adam Sandler is a sure thing. You know what you’re going to get with him (Grown-Ups 2 was number 1). Any kind of sequel is going to have some steam behind it if the predecessors were good (or not). 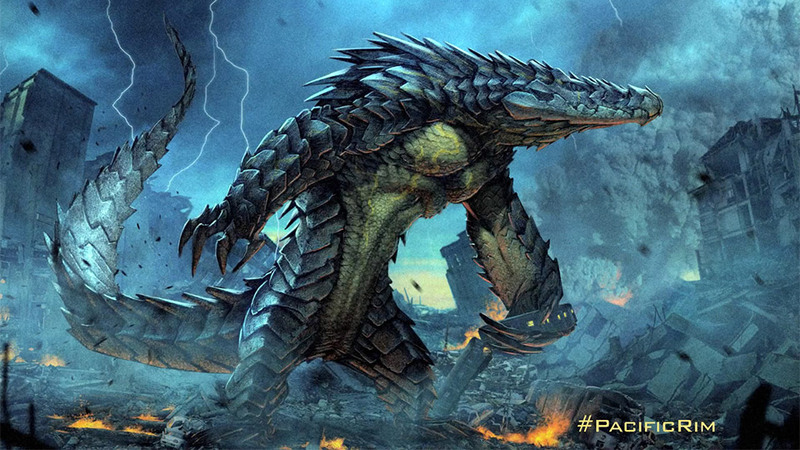 So Pacific Rim was a risk. Actors that most US audiences wouldn’t be familiar with, an unproven franchise, and some tepid reviews probably weighed down what should have been a mega hit. To hear that the movie made 100 million dollars in China alone gives me hope for a sequel or at least other film-makers taking risks as del Toro did. Hey, stay on your side of the bridge, buddy! So what makes this different from any other generic robot movie? Well, Transformers it is not. While I tend to take the Transformer movies for what they are, basic popcorn movies, Pacific Rim transcended what was a basic popcorn movie for me. The visuals, simply put, were amazing. The acting was solid. I mentioned to a friend after watching it, that I almost felt like I was watching a 80s movie. A really good one even. What stood out to me about this big budget movie that most audiences may have expected to be lifeless and cold based on the trailers? 1. Rinko Kikuchi-There are several reviews mentioning how Rinko’s portrayal of newbie Mako Mori made the movie. In a rare instance, a Japanese female was allowed to carry the main narrative arc of an action movie. This is probably the first time I can think this has happened. Which is one reason people like it so much. Mako isn’t a typical female character. Or even a typical Asian one. She is her own person and wants to get revenge on the kaiju that destroyed her childhood and left her homeless. The arc is simple, but effective. del Toro giving the reins to Kikuchi will make this movie a cult classic for years to come I believe. She delivers on every level. Is it Oscar worthy? No, but it’s a great effort for what I imagined would be a pretty stereotypical character. Mako proves herself. Kikuchi shows she can carry a mainstream action movie. 2. The Comic Relief-The comic relief in this movie was primarily in the hands of Dr. Newton Geiszler (Charlie Day), Dr. Hermann Gottlieb (Burn Gorman) and Hannibal Chau (Ron Perlman), who all did a good job of being funny without being cheesy. I find most comic relief in action movies is anything but funny. Their scenes got a chuckle out of me every time, something rare for an action movie to do. Charlie Day especially shines as a sort of punk rock scientist obsessed with kaiju so much he has tattoos of them. I thought that was a nice touch to his character. Perlman’s portrayal of Chau is probably one of the coolest comedic characters I’ve seen in quite some time. 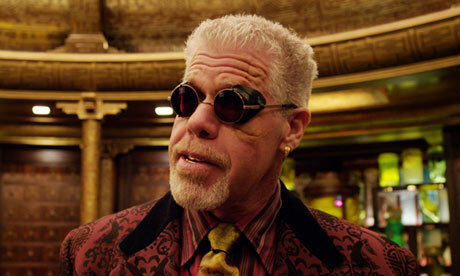 I could definitely see Perlman playing the role again if they plan to do a Pacific Rim 2. Not pictured: fancy, jingling shoes. 3. The Action-This is the main reason anyone would and should go see this movie. The action is simply incredible. I saw this in 3D IMAX and I’m glad I did. It didn’t really feel like a 3D movie, which I think was a big credit to the overall movie. Meaning I didn’t feel distracted by the 3D elements as I often do in other movies. The robot designs were cool and the kaiju looked exactly like some kind of nightmarish demon sea-creatures and not just some thrown together crap. Whoever designed these robots and monsters did so painstakingly and it shows. The sounds of metal crashing against monster skull were also amazing. I felt like this was a movie that had tons of special effects but they didn’t look hokey or just splatter all over the screen. I could actually see the action instead of the shaky cam “what the hell is happening” style that many directors like to use. Sorry, I’m a bit lost. Where is the airport? Overall, I felt this movie delivered in a big way. I’m not entirely sure I want to see a sequel even. I want to see Hollywood try to take risks more often by creating new intellectual properties. While Pacific Rim borrows heavily from Japanese cinema (especially Godzilla), it does so in a way that doesn’t feel hacky or a poor imitation. I hardly ever get excited by remakes. So I hope the international success of Pacific Rim spurs it to become a sleeper hit and that more studios take a shot at new IP for action movies. That’s my hope. Pacific Rim gets a recommendation from me. If you didn’t see it in theaters, definitely check it out on DVD. My next entry will be about fantasy writing, primarily Phil’s Rules for Fantasy Writing. These aren’t any rules I think others should follow, but just what works for me. Check it out next time! 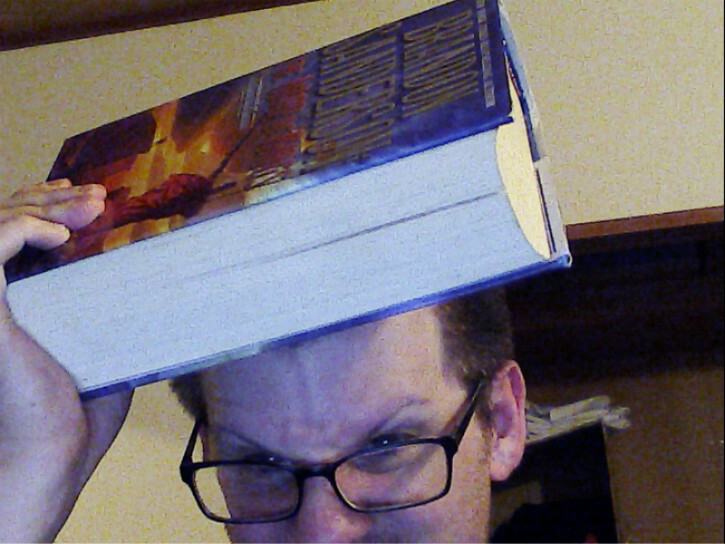 I’m no Brandon Sanderson, but I can balance his massive book on my head!